The perfect home-base for your Olympic National Park adventure. To get to Shi Shi Beach you'll need to first conquer a 3-or-so-mile hike through the woods until you reach the ocean. From there, you'll need to descend about 200 feet down a cliff, either with the help of a rope along the trail, or using tree roots for support. But it's all worth the effort when you finally land on the beach. 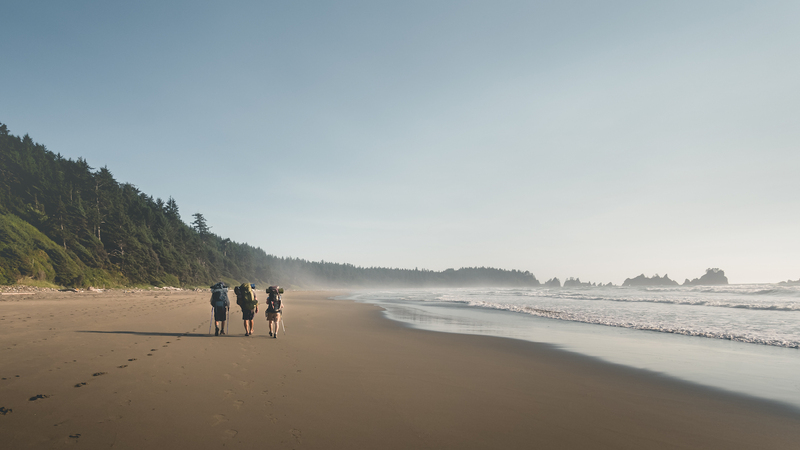 You'll definitely want to get a camping permit (you can get them from the Wilderness Information Center or the South Shore Lake Quinault Ranger Station) and bring along a tent, because you won't find any more magic place to spend the night in the park than on Shi Shi Beach. Before heading out on your Olympic National Park adventure, hit up Joyce General Store in Port Angeles, which has been in operation since 1911. In fact, it's the longest continually-operating general store in the entire state! Olympic National Park is famous for its stunning temperate rainforest (Hoh, Queets, and Quinault Rainforest), so it shouldn't be too much of a surprise that this park receives a lot of precipitation. In fact, it's the wettest part of the continental US! If the thought of hiking and camping in the rain kinda bums you out, then know that the park experiences dry spells in July, August and September. But either way, definitely pack your rain gear, and keep an eye on the weather forecast, since you never know! The rain and the fact that much of the park's old-growth forests are protected wilderness means that trees and other plants can not only grow in the park, but they can flourish. The Quinault Rainforest is known as the "Valley of the Rainforest Giants" and is home to the World's Largest Spruce Tree. It is 191 feet tall, boasts a circumference of almost 60 feet, and is roughly 1,000 years old. Since much of the park is protected wilderness, the only way to get to the park's interior is to backpack in, and the hiking can be pretty intense. If you're looking for something a little more do-able, there are still tons of options. The Hoh River Trail is an easy way to explore Hoh Rainforest, it's less crowded than the always-popular Hall of Mosses Trail, and if you don't want to do the full 17 miles, you can always turn around and hike back the way you came. There's also the High Divide Loop, which is about 19 miles and will take you through old-growth forests, into alpine meadows, and past 8 lakes, all of which are as clear as any you'll ever see. Sol Duc falls is a gorgeous waterfall that's able to be enjoyed year-round. Nestled in an old-growth forest, surrounded by subalpine lakes, and the Sol Duc River, the lush falls provide a stunning contrast to the white peaked Olympic landscape. If you go in the winter however, you'll probably need snowshoes. To get to the falls, drive less than two miles from Fairholm, west on Highway 101 til you get to Sol Duc Hot Springs. Then about 14 miles later you'll get to a parking lot and the trailhead for the Sol Duc hike. The Hoh Rain Forest is all that remains of a massive forest that once stretched from California to Alaska. It still recieves about 140 to 170 inches of water a year, so bring along a rain jacket just in case! The Hoh Rainforest also has a Campground which you should take full advantage of, because honestly, nothing sounds more relaxing than camping out in one of the country's most verdant forests. A trail that's slightly easier here is the Spruce Tree Trail, which is 1.2 miles. This hike offers views of the stunningly blue Hoh River. It's fed by glacial melt, which contains pure water and ground up glacial rock, giving it a distinctive opaque blue that contrasts perfectly with the green forest. It might seem weird to imagine a rainforest so close to a glacier, but Hoh is a temperate rainforest, not a tropical one. Before heading back to the campground, explore the area outside Olympic National Park, and visit the charming town of Forks. If you wanna grab a bite the Mill Creek Bar and Grill is the place to be. It's a local watering hole that serves up solid pub fare. Olympic National Park is filled with all kinds of varied, but equally beautiful landscapes. From the lush, mossy Hoh Rain Forest to sweeping mountain views from the High Divide Loop to the misty Sol Duc Falls, it's hard to pick the prettiest spot in the whole park...but Shi Shi Beach can definitely give all of the other notable landscapes in the park a run for their money. Unlike the country's other beaches, it's remained untouched and undeveloped, making it the perfect place to spend a night listening to the waves.